We evolved, no one lived to be 600 years old. But for the sake of poetic license, we’ll look at the story as though Noah could have been alive. If the Noah story is true, how can the above not be true? The folks at Answers in Genesis claim that the pyramids are post flood! “…. With all this evidence, the Great Pyramid is clearly post-Flood.” See “Were The Pyramids Built Before the Flood?” by AIG “researcher”, Bodie Hodge. The implications of this are enormous. It means that we have to squeeze in the ice age, the stone age, Neanderthal man and the development of an Egyptian civilization capable of building the Great Pyramid at Gaza and then build the pyramids between the flood and another AIG fixed date, 1447 BCE, the Exodus. Thank you people of AIG. You have made my case…. Population flourished after the flood even though the earth was a sodden mess and there were no plants and there were only two of every kind of animal. If the flood story is true, then population went from 8 people to the millions living in Egypt and China in 104 years! Within minutes of getting off the Ark, every herbivore (who had no plants to eat) would be eaten by a carnivore. Soon the carnivores would turn on Noah and his family – meaning the extinction of the human species. Eventually the carnivores would turn on each other. Finally the last of the carnivores would starve to death. There would be no inhabited earth if the Noah story were true. It is well known from the fossil record, that about 99% of all species that ever existed, are extinct. How is it that God, having created everything and having declared that “it is good”, destroyed most of what he declared to be good? It was impossible for civilization to reach the state it it had reached (e.g. pyramids) so soon after the flood because we had to start all over again with an inbred population and the earth was desolate. The “flood” required more water than could have possibly been produced without violating all natural laws. ” Fifteen cubits upward did the waters prevail; and the mountains were covered.” That would include Mt Everest at 29,000 feet covered by an additional 22 feet of water. The volume of water to accomplish that is incomprehensible.The Bible tells us that within a 40-day period it rained enough to cover this mountain! That would mean that 29 feet of water fell per hour for 40 days! (Do the math!) That’s nearly half a foot of water a minute! Today we consider it a heavy downpour if we get an inch or two an hour. Could the ark have survived such an onslaught? Imagine a caterpillar attempting to crawl across some rocks directly beneath the crashing downpour of Niagara Falls. This is the sort predicament the wooden ark was in. One square inch of a (nearly) solid column of water, falling from the “firmament” which was, let’s say, a mile above, would have exerted a pressure of 2280 pounds/sq inch. The area of the Ark’s deck was 3375 sq feet. The pressure on the surface of the Ark was 1,108,080,000 pounds! Do the math (3375 * 144 * 2280). Not even modern ships could survive that kind of onslaught. And the water provided from the “fountains of the deep” does not change the result very much. The friction created by the required torrents would have boiled the water and Noah and the Ark inhabitants.”The fountains of the great deep” would only have provided about 1000 feet of water to the 29,000 feet. Again, do the math assuming that one half of the interior of the earth consisted of water (which it did not). Wouldn’t the earth have collapsed in on itself from the weight of the water from above? No matter; none of this happened anyway. At 29,000 feet, the temperature would have been approximately 48 degrees BELOW zero and there would have been no oxygen. On Sept 5, 2014, a small private plane lost cabin pressure at 25,000 feet. The pilot lost consciousness and the plan crashed. He was observed breathing but slumped over the controls by an accompanying fighter jet pilot until the “windows frosted over”. At 29,000 feet, Noah et. al. would have suffered the same fate – anoxia! NOTE: a commenter has pointed out that there would be a new sea level at 29,000 feet and the atmosphere would still be the same as it is for us. Probably true – so this point is probably moot but I’ll leave it in, in case he’s wrong – but I don’t think he is. WAIT…THIS JUST IN (2/24/2019) See comment below from Physnoct. However, THIS is true. The ark, with no steering capability would have gone broadside in the first big storm and would have taken on water and sunk. This is proven in the Netflix documentary “The Truth Behind The Ark” (start at 30:30) where marine engineers built a scale model of the Ark, complete with appropriate weight distribution and subjected it to simulated storm conditions in a test tank. A watertight Ark pitched and rolled over 50 degrees – everyone on board would have been killed by the violent thrashing. Although God told Noah to seal the seams with pitch, it would have been impossible to make the ship water tight. Not even modern ships are water tight. They all have bilge pumps. According to AIG and The Ark Encounter, The “Flood” was strong enough to break up the single land mass, Pangia, and create continents and form the Hymilaias. Noah’s ship would have been tossed and turned, killing all its occupants before it quickly was overwhelmed with 50 foot waves. A ship as long as the Ark would have been subject to much bending and twisting and loosening of joints. This too is proven in the aforementioned documentary.Once the water tight seals were removed, the “Ark” sunk almost immediately after the simulated storm began. Moral: There is no way a wooden ship the size of the Ark could have survived the storm conditions that were necessary in order to reshape the earth. You know that the Creationists claim that all the continents and the Himalayas were formed because of the things going on during Noah’s big adventure. That would have been some storm. There are only 10 generations between Adam and Eve and Noah. Noah would have been a stone age hunter-gatherer living hand to mouth with no time to do all the things associated with the Ark story. Noah could not have been a “wealthy” man capable of hiring others to build the Ark as the Creationists say he was. “Wealth”, in his era, was a sharp stick. The task of building a seaworthy ship of the Ark’s size was impossible for eight ignorant people to accomplish given the state of technology 10 generations after Adam. 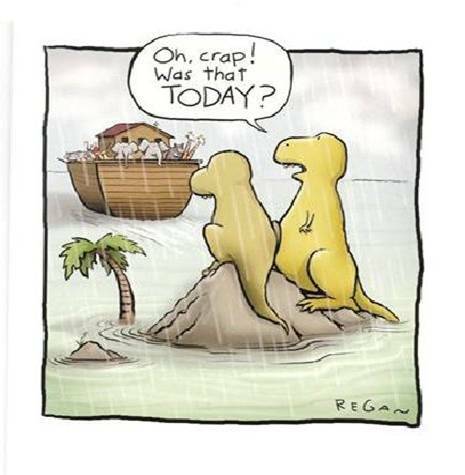 Due to inbreeding, Noah was most likely a moron or less. Eight people could not perform the tasks of collecting, corralling, food gathering, food distributing and tending the thousands of species that descended on the Ark site during construction. The number of animals on board the Ark would have numbered in the millions if the command was taken literally. This would include the standard vertebrates but also, dinosaurs, insects, millions of bacteria and thousands of extinct species that, according to young earth proponents, died after the flood. Ken Ham, the inventor of the Creation Museum explains that on Noah’s ark there were only one pair of the felines, canines and elephants that represented their “kind.” After departing the ark those pairs of animals “diversified” (ie. evolved) into all the feline, canine and elephant species we see today including all of the fossil species that have ever been described..
For the creationist version of “evolution” to be true, animals would have to have evolved from a few “kinds” to millions of species in less than 1500 year! The Bible provides compelling evidence that this did not happen. Massive fast paced evolution has not happened in the recent past. The Bible refers to or describes over 100 animals. In most cases we can be quite certain from the descriptions that these animals represent species that are still around today and look the same today as they did when the biblical authors laid eyes upon them. The Young Earth Creationist model suggests that a pair of canines got off the ark and then changed into many species of foxes, wolves, coyotes, and domestic dogs. If this is the case we should find many intermediates of these living in historical times. But what do we find in the scriptures. We find that even in the earliest records, people easily distinguished between foxes, wolves and domestic dogs and probably jackals. We can also go to extra biblical sources like Egyptian writings and see images of domestic dogs which look like breeds of dogs that live in Egypt today. We even have mummies of dogs and other animals that confirm that they are no different from those we see today. It seems that there is no evidence of speciation here at all but rather fully formed species that have maintained the characteristics of species since their very first mention in scripture. The source for this debunking of Ken Ham, et. al. is found in this Feb 5, 2016 article in the Natural Historian. Plants would have had to have been brought on the Ark although they are not mentioned. They were needed to provide food and to perpetuate all plant life. No plants can survive being submerged for a year. Noah was only told it would rain 40 days and 40 nights; he had no idea he would be on board for over a year; thus he had no idea how much food and water to bring on board. The task of provisioning the ship with appropriate food, keeping the food fresh, and gathering and storing water for a years journey was impossible for eight people to accomplish, given the state of technology 10 generations after Adam. The water pressure on the fish and life in the sea would have already been over 15,000 PSI at the previous sea level. Pressures would have increased as one descended below the previous sea level. Salt water fish cannot live in fresh water, fresh water fish cannot live in salt water; both types would have perished in the combined waters. The space required to keep the animals, two of each kind or SEVEN pairs of clean (see Noah’s charge from God), food and water exceeded the ship’s total cubic feet. Our Supreme Truthsayer has done a complete analysis of the space required to keep just one pair of all kinds. It can be seen here. The Ark would have displaced 24,000 tons The weight of animals, food, and water easily exceeded 24,000 deadweight tons and the ship would have sunk. Proof is presented here. The task of watering, feeding, exercising the animals and mucking the stalls would have taken more man-hours per day than Noah and kin had. It was impossible for the remaining animals to live or return to their “native” habitats (think Kangaroos to Australia) after the flood because the earth was a sodden mess and there was no food or fresh water. It is impossible for a species to develop from a single male and a single female. When a species numbers drop below some critical mass, the species goes extinct, EVEN THOUGH there are some males and females still alive. Ask any biologist. Astoundingly, the omniscient God realizes after the flood that mans’ imagination is evil from youth (Genesis 8:21) and REGRETS what he has done. He now allows us to be evil (free will) to this day, no different than those he drowned in the flood. So we have to now realize that God tortured every man, woman, child, baby and unborn child (i.e. abortion) , and animal (why the animals?) on earth because he made a mistake? After being subjected to storms like no one can imagine, earthquakes that allegedly changed the topography of the earth, the Ark came to rest within 100 miles of where it was launched! How likely is that? Oh… God guided it back there? Why? What did it matter? But if Noah was perfect (as the Bible claims he was in Gen. 6:9), then he wouldn’t have been tainted with the imperfection of sin, and just as the descendants of Adam had “inherited” sin, the descendants of Noah would have inherited sinlessness. So Noah’s descendants (which would be the entire human race) would have escaped from “Original Sin” and wouldn’t need to be “saved from their sins”. This makes the whole idea of Jesus’ sacrificial death superfluous. Thanks to Steve McRoberts for identifying this monumental contradiction. This story just doesn’t hold water. Somebody commented a video on Youtube, saying that the atmosphere being raised 29000ft above by flood waters, would be less dense. The resulting less dense air would have made the sun more powerful, giving much more intense sunburns. I made the calculations to check how much the density would change. Assuming the mass of atmosphere doesn’t change, the volume would change. The atmosphere starts at 100 km. R = 6371 km. Finally, the effect of the atmosphere being raised by flood water would be rather small. Since the story of Noah and the Sumerian versions are fairly similar then Noah may have come from Sharupak as per the Mesopotamian account.. Diggings there showed the town was hit by a sea wave. The ark did not flow out to sea but was stranded o Judi Dagh. This mountain is much closer to Nineveh than Agri Dagh the conventional Mt. Ararat. An inscription on this site shows the Assyrian king Sennacherib sent an expedition to the mountain. As for radio carbon dating the Suess effect destroys all hope of getting accurate dates before 3500 B.C.The fllod disaster added so much extra carbon dioxide to the atmosphere dates before this time are stretched by an unknown amount of time. There was no Ark! Please counter all the above arguments about the impossibility of there being an Ark before explaining why the Ark could have existed. Could you be more specific or do we have to read through all those stories? Reading this reminded me of papers I wrote while attending Florida Junior College in Jacksonville, Florida. I have made these EXACTLY same arguments over the years. I even have the same calculations as Bishop Usher for the flood at 2348 BC. If there was an All Knowing Mightyone, and he gave us Laws, and death was the penalty for breaking those Laws, then people when they broke those Laws would just die. That would be the way a knowing Mighty- One would most likely set it up. But , no ! Rituals, and sacrifices, but in Jer.7:22, For I spake not to your fathers, nor commanded them in the day in the day that I brought them out of Egypt, concerning burnt-offering or sacrifices. Notice YHWH says he is not the author of sacrifice, any kind of sacrifice! believing in a sacrifice of a son. What hogwash ! People seem to think that the sacrifice of a son is something new. It is not. made his son to pass through the fire, according to the abominations of the heathen…….. Son sacrifice is abomination no matter if his throat is cut and the blood is poured on the alter, and his body burnt, or put on a stake, or cross, with a sword shoved into his body so his blood will pour to the ground! They are both murder. The book called the Bible is he biggest cancer of people that believe in it, as the books of all the different religions. A comment for the flood requiring more water than possible. -This means that not only did it rain BUT all of the underground water came up onto the Earth. B). If you think about Noah’s flood from the perspective that the huge amount of water covering the Earth redeposited all of the dirt, sediment, sand, plants, and even mountains, then you would see that Mt. Everest may not have even been around in Noah’s age. – For instance, the water pressure at the deepest trench in the sea (Mariana Trench) is 8 tons per square inch. Most likely, this pressure could move the dirt, sediment, and sand found in any mountain enough to either create a new mountain or crush an old one. You are attempting to put New Wine into Old Wineskins by taking modern scientific knowledge and applying it to an ancient understanding of the natural world by primitive cultures. Did you read the post by Jero Jones? Jero gives a good scientifically backed explanation of a great flood in Europe about 8,500 years ago that is responsible for the land bridge disappearing between Britain and the European mainland. Did you also note that I had gone to significant efforts in an earlier post, to summarise the deluge myths of other more ancient cultures that were later adopted and reinterpreted by the Israelites/Jews? As I write today, 1st January 2016 AD/CE, the UK has experienced severe flooding, the likes of which have not been seen for at least 70 years. The Lake District in North West England is more ‘Lake’ than ‘District’, whilst Lancaster, Leeds and Bingley have been flooded. A friend has had her home in Bingley flooded and lost her car to rising water levels as the River Aire has blown its banks. Even with today’s scientific knowledge about weather and climate, this is still a very traumatic experience for humans. How much more traumatic would this event have been to the pre-scientific, primitive, superstitious people living through floods, volcanic eruptions, land slides, earth quakes, drought, severe pestilence during their lifetimes? No doubt some Evangelical/Fundamentalist Jesians( Christians) will claim that the UK floods are ‘God’s just punishment’ for the United Kingdom legalising gay marriage and not adopting the Theocratic rule of the Jesian god. Some Jihadist (Islamic) clerics will no doubt blame the floods on British women dressing too sexily and the UK government refusing to adopt Sharia Law. Do you notice a pattern here? A traumatic event happens and the pseudo-religious community ‘interpret’ the event to be the result of divine punishment for violating some religious rule or requirement of some deity. The same happened back in ancient times, only they did not have sciences, meteorology, environmental science, etc, to know that earth quakes, volcanoes, tsunamis, floods are not caused by an invisible supernatural entity dishing out punishment for people not sacrificing their enemies, children, cattle, grain, foreskins to appease the wrath of the said deity inflicting the retribution. Regarding the myth of the universal flood in Genesis, why are Kangaroos never specifically mentioned in the text? Aussie comedian Jim Jeffries refers to this in his shows. Could it be because the writer of Genesis was only aware of things within a 2 mile radius of where they were writing from? Could it be that Australia and marsupials were unknown to these primitive people in the Middle East? But hang on! Didn’t God write the bible through human authors? So therefore Kangaroos should have been mentioned in the bible because they are such fascinating creatures. What about other famous Australian Marsupials like Thylacines (Tamanian Tigers), Tasmanian Devils (you’d remember the blood curdling sounds these things make), Quolls, Wombats, Koalas, Bandicotos? Or what about Australian Monotremes like the Echidna and Duck Billed Platypus? Surely such weird and exotic animals would have been mentioned by the writers of Genesis, as they would have been so memorable to primitive peoples? For who can forget the unique method of travel employed by macropods (Kangaroos, Wallaroos, Wallabies, Pademleons, Quokkas, Bettongs, Poteroos)? Just how did the Kangaroos get from mainland Australia to the Middle East for Noah to load onto the ark and save them from a great deluge that would flood the entire Earth? Did the kangaroos use boats? Swim to Asia then walk the rest of the way to the Middle East on foot? I say this because the land bridge between Asia and Australia had long since disappeared so boats or swimming would have been the only options available to Kangaroos. When the flood was over, how did the Kangaroos get back to Australia? I am not aware of any fossil evidence of Kangaroos in Asia at around the time of the Great Deluge. Unless god ‘magically’ moved them from Australia to the Middle East and back. The text of Genesis is silent on how the animals all travelled to the ark to be saved. One thing people often forget, what about raptors like Wedge Tailed Eagles? How did they survive if the land was completely flooded as they would have been unable to hunt for small mammals or marsupials scampering along on the ground if it was under almost 5 miles of water (height from original sea level to cover the peak of Mount Everest)? Why do we automatically assume that the Ark was a boat? All the text says is build an “ark/Box/Chest”. The dimension do not mention any angles for a Bow or a Stern. Compare the Genesis accounts of the Jewish flood myth against the far earlier Sumerian ‘Epic of Atrahasis, Eridu Genesis and Babylonian ‘Epic of Gilgamesh’ and you can clearly see that Genesis is an Israelites/Jewish rehashing of these older legends, adapted to fit their monotheistic theocracy and Jewish nationalism.. The earliest known flood myth is contained in fragments found in the Nippur excavations, is of the Sumerian ‘Eridu Genesis’ story. In this saga Enki the Sumerian god of creation commanded Ziusudra to build a large chest and warns him that the rest of the gods were planning to destroy mankind in a flood. The fragments of text containing the instructions and dimensions of the chest are lost, but the the surviving fragments continue with the story that after the flood, Ziusudra repopulates the Earth . The flood lasted just 7 days, Ziusudra makes several appropriate sacrifices to An the sky god and Enlil the chief god. An and Enlil then give Ziusudra eternal life in a place called the Dilmun that is a paradise (The Garden of Eden in Genesis is based on the Dilmun the Sumerian garden of Eden). Notice any similarities? The Epic of Gilgamesh is an ancient Mesopotamian poem and is one of the oldest known works of literary fiction dating back to the third Millennium BC (approx 2150 – 2000 BC). where Gilgamesh meets Utnapishtim in the Dilmun and Utnapishtim tells how Ea (equivalent of the Summerian god Enki, like Jupiter is the Roman equivalent of the Greek chief god Zeus) warned him that the gods planned to destroy all life through a flood and commanded him to build a vessel to save his family, friends, his wealth and cattle. After the deluge, the gods repented for their actions and made Utnapishtim immortal. Sound familiar? There is also an Islamic flood myth that is similar to the Genesis myth, with the main differences being that Allah sends the flood at Noah’s request as punishment for those who refused to listen to Noah’s preaching about Allah (how little things have changed since then). The ark comes to rest at the top of Mount Judi, near Mosul in modern Iraq instead of Mount Arat. Then there are Ancient Greek legends too, not surprisingly,like flood of Ogynes and the Flood of Deucalion.. The Deucalion legend is similar to Noah’s Ark: Prometheus advised his son Deucalion to build a chest. The flood lasted 9 days when Deucalion and his wife Pyrrha landed on Parnassus. There are older variants of this story that have the arck land on either Mount Othrys (according to Hellanicus) or on a mountain in Argolis. After the rain stopped, Deucalion and his wife made sacrifices to Zeus, who told them to throw stones behind them to repopulate the Earth with people. The stones that Deucalion threw became men, and the stones which Pyrrha threw became women. Plato, in his book “Laws, Book III,” estimated that the Flood of Ogynes occurred 10,000 years before him, so about 10,500 BC. Would Plato’s estimate for the date of the flood of Ogynes possibly fit in with your geological evidence for a flood that created the English channel between Britain and mainland Europe? Hindus have the flood story of Manu the first man and ancestor of all the kings of India, in this story the fish tell Manu to build a boat and save himself from a great flood that was coming. The fish instructed Manu to take two of each animal on the earth and seeds from every kind of plant. When the flood hit, Manu tied his boat tot he fish who pulled the boat through rough waters. In the Himalayas the fish told Manu to tie his boat to one of the mountains and wait for the water level to drop. After the flood Manu offered a sacrifice and was rewarded with a wife to repopulate the Earth. In some Hindu texts Brahma and Vishnu appear as the fish. Is it me or can anyone else see the striking parallels between the Genesis flood myth and the flood myths of other more ancient cultures and other religions? I have to say that a great flood did occur, however, it may have been the flood that through ancient memories was handed down and became the great flood of the story of Noah! The flood I write about happened around 6,500 BCE or 8,500 years ago, which caused the British Isle to become an archipelago in North Atlantic, flooding the land mass between what is now Britain, and continental Europe. A land bridge known as Doggerland that once connected mainland Europe to Britain. Doggerland according to geological surveys stretched from Britain’s east coast to the Netherlands, Germany, and the Jutland peninsula (Denmark). Doggerland is also known as Britain’s Atlantis! Some scientist and scholars have hypothesized that a Tsunami created by doggerland flood travelled through the Mediterranean and breached the Bosporus land bridge/barrier and created the Black Sea. This all happened in the same time frame, which is quoted to have happened before 5,500 BCE. The story of a great flood is not mentioned before this period, and there are connection between the Black Sea and Mesopotamia, where the story of the flood was first mentioned. The British museum has a 3,700 year old clay tablet with instructions on how to construct a Round Arc. [http://blog.britishmuseum.org/2014/01/24/was-the-ark-round-a-babylonian-description-discovered/] As I aforementioned that there is links between the Black Sea and Mesopotamia, one of the link I have already mentioned is the clay Round Arc tablet, which is of Mesopotamian or Babylonian origin. The origin of the Euphrates river is between the Black Sea and Lake Van. The book of Genesis 2:13 mentions the Gihon River, thought by scholars to be the Valley of the Araks River, although the Bible states that the Gihon is in Ethiopia. However, on that scholars say it is a geographical error, as the Bible places Eden, by stating: a river flows out of Eden and then it is divided into four branches, the rivers Euphrates, Tigris, Pishon, and Gihon. [Genesis 2:8-14] We know that the Euphrates and Tigris rivers or in Mesopotamia (meaning—between two rivers), which is mostly modern day Iraq, but also covers part of modern day Iran, Turkey, and Syria. Creationist scholars (probably coping Ussher chronology) believe the great flood happened in 2304 BCE. [http://creation.com/the-date-of-noahs-flood] As you can see there is 4,800 years between the actual great flood in Europe, and the British museum clay tablet on the Round Arc, and almost 1,400 year between the tablet, and the Creationist timeline for the supposed great flood of Noah. Plenty of time (6,200 years) to create a myth about a flood, and a 950 year old man—named Noah! Plato mentioned the Flood of Ogynes that he estimated happened 10,000 years earlier. Could this flood of Ogynes be the same flood that caused Britain to separate from the European mainland? I know Plato’s dates are guestimates but he appears to be in the right ball park. Your post has had me thinking for some time now. We both mention exhibits in the British museum that prove beyond doubt that the Noah’s Ark story in Genesis is merely a retelling and reinterpretation with nationalistic overtones, of earlier deluge legends from ancient cultures, that in turn are based upon a distant ancestral memory of an actual flood event, like the one that caused the land bridge at Doggerland to disappear. Firstly, allow me to say that I also do not believe a large boat was constructed and saved man and animals from certain doom. However, I had 2 issues with your article that I believe you should look into. The first issue: The phrase “40 days and 40 nights” is simply an expression meaning “No one knows how long”. It is the same as saying “That took forever” nowadays. Likened to the period of time when Jesus went into the desert for “40 days and 40 nights” and was tempted by Satan. The second issue is that when Noah is referred to as being “perfect”, I believe it referring to his bloodline. One of the reason for the flood was that God had saw how “the flesh had become corrupted” due to breeding between Angels and human women as mentioned in Genesis chapter 6. “The sons of God saw the daughters of men, that they were beautiful and took wives of all whom they chose”. Genesis chapter 6 talks abbout the women bearing children which were wickedly sinful. Noah however, was a direct descendant of Adam and was pure or “perfect”. Interestingly, this changes the flood from being a punishment to mankind and more of an effort to save it before there are no more pure humans left. 40 days and 40 nights an expression meaning “No one knows”? Who cares. The whole thing is so ridiculous. Any and every particle of the story is so ridiculous that there is no point in debunking one of the debunking arguments. There are just too many. How can you learn as much one can about something that never happened? “…know as much as I can…”? Wait there may be more I can learn before I choose to disbelieve it. How do I know when to stop? I do believe I know as much as necessary. This page is an excerpt from a longer treatise I did. See “http://tschaber.net/Noah”. There isn’t a shred of possibility in this preposterous, ludicrous, oft repeated by other cultures, fable. No point in learning all one can about nothing. Ah, I incorrectly assumed that a theological discussion might develop here. Instead, it’s just another case of “I don’t believe it and you’re stupid.”. My apologies. No, this is not another “I don’t believe it and you are stupid” rant. I have shown that it is impossible for the fable to be any thing other than a fable. I have presented many situations that are impossible – air circulation being one of them. My disbelief is based on a lack of evidence after extensive investigation of the literature. This fable violates axiomatic principles of geology, biology, cosmology, botany, chemistry, physics, shipbuilding and oceanography to name just the most blatant. See my extensive analysis The Nonsense of Noah. See my list of references. What is your theological evidence? How does one hold a “theological discussion” about something that never happened? Show me that my impossible situations are possible – then we can talk about the theology. Quite correct in stating that you should know about something (in your case the Bible stories, etc. ), or as I say “you should know your enemy!” However, on another note, and it has puzzled me for six decades … how the hell did they know the purity of Noah’s bloodline back to Adam, or even Jesus’ back to king David. You don’t think that Adam, could read and write before “papyrus and ink or pen and paper” was invented, do you? I am still baffled with Cain getting a wife, where the hell did she come from? It’s like the Trinity 1 make 3 and 3 make 1, even even rocket scientist are still working that out! My wife says Cain wife must have been cloned, bless her … she is one of those half angel and half human inbred’s! “At 29,000 feet, Noah et. al. would have suffered the same fate, anoxia.” This would be true if the ark was lifted above water level up to 29,000 feet. In this case, the ark is always at water level. Of course the Ark was lifted up to 29,000 feet because the “mountains were covered”. That means Mt. Everest which is about 29,000 feet. “… in the tenth month, on the first day of the month, were the tops of the mountains seen.” Gen 8:5. The Ark would have been sitting on top of the water, at water level, 29,000 feet. I don’t get your point. Atmospheric pressure is highest at sea level. If the sea level is raised up to 29,000 feet, the atmosphere raises as well, so the pressure stays the same, or if we take into account the change of g in function to altitude, the pressure will be lower, but not as much as you claimed. I can do some calculations. THEN WHY ARE COMMERCIAL AIRLINERS PRESSURIZED? WHY DID THE PILOT MENTIONED ABOVE PASS OUT AND DIE. I BELIEVE YOU ARE MISTAKEN WRT ATMOSPHERIC PRESSURE STAYING THE SAME. OH… I GET IT. IF THE SEA LEVEL RISES… YES I SEE IT. OK. WOULD IT STILL BE COLD? MAYBE NOT. GOOD POINT. You said” I don’t get the point.” Neither did Noah, because he was absence of oxygen supply to an organ! So how did he manage to father children or even play music? It depends on which organ that you are thinking about! And don’t forget that Noah was 900 years old set sail on the HMS Arc. Which is pretty good going for a man of his age! I like the pic above… question I have is why There’s the specific measures to build it with precision? & same with the Tabernacle? How come it’s so specific like that was the order told to do so because clearly it seems they didn’t know much about that stuff so did someone more advanced write this? You call giving the height and width and proscribing one window “the specific measures to build it with precision”? You think it took “someone more advanced …” to write this? The prescriptions for building the Ark are hardly advanced. Ok ok I hear u. I haven’t read that part in awhile. I just remembered reading alot of measurements in the 1st few books. The Ark, The tabernacle & garments etc… when I said “More advanced” I meant whoever wrote it. The people from the supposed beginning wouldn’t know how to do that stuff, where did they learn measurements out of nowhere? I’m saying maybe it was written later than proposed? It’s only assumed Moses wrote the 1st 5 books in which again no one can answer me on how did he write his own Death account unless he knew was going to die or Joshua who was next wrote it but it doesn’t say. Plus everyone who’s Christian says it doesn’t matter, doesn’t change the validity of the story. What I really want to know is since it’s mainly in 3rd person, could have someone else wrote these stories? SO WHAT YOU ARE ACTUALLY SAYING IS “DO AS THOU WILT” ? How do you get “Do as I want” out of anything I have said?